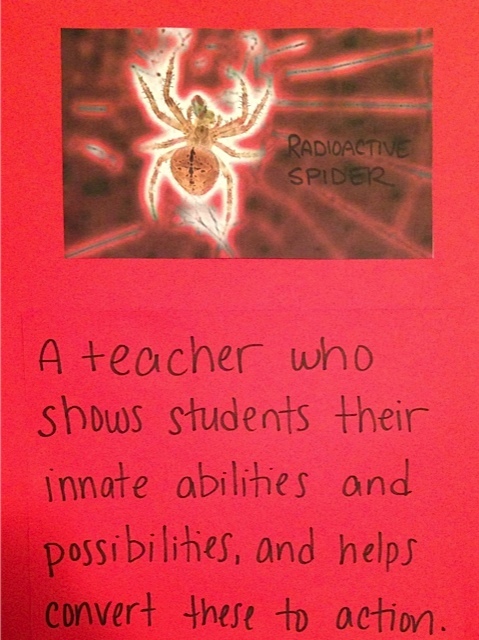 Radioactive spider: A teacher (or parent or inspirational person) who shows students their innate abilities and possibilities, and helps convert these to action. The teachers loved this idea. They were inspired. And they wanted to know more. How might I be a radioactive spider, and show kids that they can do all the great things in life that they are capable of doing? When she published The House on Mango Street in 1984, author Sandra Cisneros became the first Mexican American female to do so through a mainstream publishing house. It was a radioactive spider bite that helped her get there. Though she read voraciously from a young age, in school Cisneros was an average student and in fifth grade, for example, she received mostly Cs and Ds. This same year, she was called out by her teacher for being a daydreamer, and for a long time felt that this was something wrong with her. In high school, she finally got bit by that radioactive spider. A supportive teacher-mentor recognized her passion for reading and creative writing, and she identified and encouraged this ability. The teacher demonstrated how she could draw upon her creative writing skills and apply them to her other studies. She also emphasized that if Cisneros wanted to pursue her talent as a career, it would be beneficial to strive for higher education to hone her craft. Ultimately, Cisneros graduated from Loyola University in Chicago and then obtained a Master of Fine Arts degree from the prestigious Iowa Writers’ Workshop at the University of Iowa. She identified, validated, nurtured, and taught her how to apply her interests and strengths (i.e., daydreaming, reading, creative writing) productively. She created motivation for continued academic learning. She provided a personal connection to school in the form of a mentor relationship. Cisneros’s story expands upon the “what” of a radioactive spider bite. The three components are essential for maximum potency. Too often interests and strengths are seen by students and adults as distinct from school and academic domains. But it is crucial to be able to integrate the two in order to promote the holistic growth of a child. Even the most obscure interest - let’s say, a pet rock collection - can give clues as to how a child thinks and what academic domains might capture his interest. So you like pet rocks? Let’s look at geology. Or collections. Or what a love for collecting might say about a person. What might be all of the things one can collect? How might you tie your research paper into investigating famous collectors and their collections? But we still haven’t exactly gotten to the how. You ask, as a teacher, parent, or adult who knows a child, How might I become a radioactive spider? Let me start with this. You already possess this superpower and, like Peter Parker, you need to consciously deploy it. Being a radioactive spider is joyful, fulfilling, and easy to do. But it’s only easy if you approach children with joy, inspiration, and openness to individuality. Fear that every child should be exactly like other children, or fear of tests and falling short of outside-imposed goals, or fear that a child is lacking because he hasn’t yet achieved a skill that another child sped by months ago, is the first thing that will shut down your radioactive spider superpower. And now let’s build upon Kaufman’s metaphor. Everyone knows that (most) spiders spin webs. For adults to be powerful radioactive spiders, they must start with the first step. They spin a web - an environment - of possibility. The environment, like a web, is characterized by openness and invites curiosity. Unlike a spider web, it is tolerant of mistakes. It may even encourage mistakes so that one can learn from them. And then there’s the content. In a classroom the web is made up of engaging, intriguing units of study designed to invite original thought: a rich curriculum replete with the arts, culture, problem solving, and experimentation. In a home, it is access to a variety of materials, books, online resources, tools for experimentation, and opportunities to explore. Every adult has the potential to be a radioactive spider. All you need to do is utilize the power you already possess. 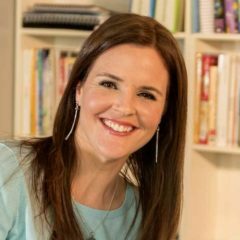 By amplifying your view of intelligence and creativity, and learning how to view and support each child as a unique individual, the potency of your superpower will take effect and inspire the children in your life to become who they were meant to be. Expand your view of intelligence. Know that each child has interests and gifts that are waiting to be discovered and nurtured. Spin a web of possibility: provide many opportunities, materials, and books so that children can have a wide variety of experiences and opportunities for self-expression as they learn where their interests, inspirations, and talents lie. Bite! When you identify a talent or interest, point it out to the child. Provide more opportunities to grow that interest. Relate the interest/talent to academic domains. For example, if a child has a passion like naming birds, how can this be incorporated and supported in her academic day to provide motivation and interest? Can the child translate the parts of the bird into Spanish as an entrée to language learning, or measure wingspan and find bird population statistics to apply math, chart bird migration paths for geography, study the integration of birds and culture for history . . . you get the idea. For children, interests often wax and wane. They might be deep into birds one month and on to something else the next month. If this is the case, keep observing and repeat the process. Chances are you will find commonality - underlying skills and talents that drive interests -which can be the catalyst for your next bite. Smutny, J. F., Haydon, K. P., Bolanos, O., & Danley, G. E. (2012). Discovering and developing talents in Spanish-speaking students. Thousand Oaks, Calif.: Corwin.